When it comes to trilogies, the middle installments are often the ones that end up being forgotten, because they don't have the benefit of being needed for context that first installments have, and by default usually have less at stake when compared to final installments. In comparison, I have always thought of The Golem's Eye as being the point where things really start having impact. It is an example of how to get a trilogy absolutely right. 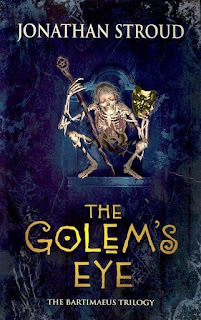 As in my previous review, this is more an analysis of themes that I found particularly interesting re-reading The Golem's Eye as an adult. 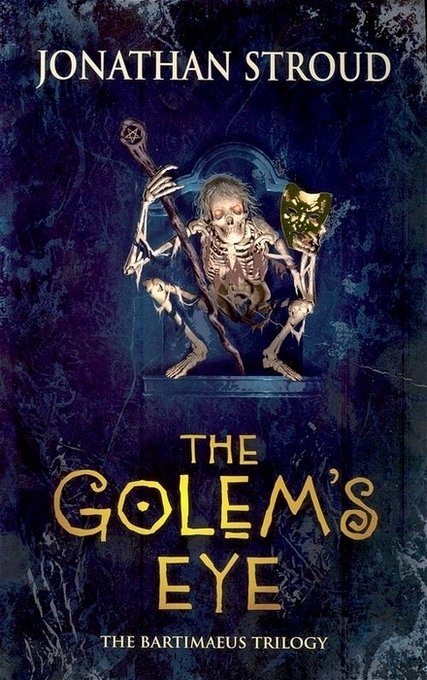 The Golem's Eye again follows Nathaniel, now known to the wider world as John Mandrake, after he has started work as a junior minister in the government ministry of Internal Affairs. At the tender age of 14, he is tasked with tracking down and apprehending the commoner group known as the Resistance. They have been making a general nuisance of themselves through a series of artefact thefts and minor attacks on magician-heavy areas, but so far it has all been fairly minor. Until one night when an entire street of shops catering to magicians are gutted in the space of a night. Nathaniel finds himself summoning Bartimaeus again, in order to find out whether the Resistance is truly responsible and, if not, who is. Additionally, the reader is introduced to the viewpoint of Kitty Jones, a commoner and member of the Resistance whose comrades are preparing for the raid of their lives. When I re-read The Golem's Eye, I realised pretty quickly that I would probably find most to talk about in the Resistance, for one primary reason: this is the first time they've really been introduced as more than a side note, and boy do they make an impression. When I was younger, I don't think I was really in a position to appreciate just how important Kitty's character is in the grand scheme of things. Back then, she was just the everywoman who is there to ground the narrative after spending time with characters who just regard all the magical chaos with a considerably more casual attitude. Now, having gotten more interested in politics of feminism, LGBT+ and disability rights, she becomes so much more personal and relevant. In this new light, Kitty's narrative becomes a warning against the things that can tear apart a budding movement, even before you take into account all the magic trying to take them down. Kitty and the rest of the Resistance are spurred into action largely through the personal injustices that they and their loved ones have suffered, combined with discovering their resilience to magic and a means of fighting back. At the beginning of Kitty's narrative, she finds them in the unenviable position of being considered more as a nuisance than a real voice of revolution, and with no-one willing to put forward alternative strategies. Adding to this, it's obvious from the offset that there are a couple of points that are creating divisions within the group, yet no-one ever tries to talk through them or resolve them. The first and most obvious is the attitude towards what the group does with the magical artefacts that they steal, specifically the ones that can be activated with nothing more than a few phrases. There are some within the group who believe that any weapon that can be used in resisting the magicians should be used, while others believe that using these weapons will only make them as bad as the group they're opposed to. When it comes to protest and the whole violence/non-violence question, I would argue that there are situations where both can be appropriate, but it's always a slim line. The Golem's Eye seems to weigh in more on the non-violence end of the spectrum, but that's as much because there's an acquisitive angle to it. Towards the group's lowest point, it's obvious that the remaining Resistance members are stealing these items as much for their symbolic value as for the use that they are to the cause. When they start wanting these objects for themselves and not for their use, then they become that much closer to the people that they hate. It's an interesting point to consider, but seems a little bit difficult to fully empathise with. The second division seems to be one that only Kitty is concerned about, but I would argue is the more important of the two. At the beginning of Kitty's narrative, she and two of her comrades steal some items from a shop that caters to magicians. Then, against Kitty's express orders, the other two set the shop on fire. While she is inwardly complaining that they're subverting her authority, she audibly makes the argument that the majority of the people who worked in that shop were commoners, not magicians. Her companions don't seem bothered by her complaints, brushing it off as inconveniencing collaborators. Despite the fact that the majority of commoners thus support the magician's regime, simply because they do everything that magicians don't want to do. And that summarises the most insidious thing that can happen in a group based on politics and ideals: when certain parts of a group refuse to consider specific types of people worthy to be in the same league as them. You get it in all sorts of movements: feminists who shun transwomen because "they're not real women", gay men and lesbians who shun bisexuals "not picking sides", and mentally disabled people who are dismissed because their disability isn't visible. If your politics are very black and white, you risk alienating a large proportion of people who would ordinarily support your cause. It makes me disappointed that it doesn't really get addressed as much in series. I would have liked to have seen how the Resistance continued, whether they would get more extremist or whether they would mellow out. Alas.